My first post for 2016, and it feels great to be posting again. I hope you guys are as excited as I am. This card I made is the result of not having the supplies I needed to do what I wanted and experimenting with the supplies I did have in hopes of accomplishing something similar. Well, I would not call my end result similar by any means. But what I did come up with is a beautiful and stunning effect. It’s simple and elegant and it I love it! I couldn’t wait to share it with you all. What I originally set out to do was to take my water brush and my re-inker and sweep it across my watercolor paper to create a unique watercolor background before I went to work stamping my images. I am sure you have tried this technique before. But, what I soon came to realize was that I did not own the re-inker for the color I was using. Ugh!!! What’s a girl to do??? Okay, no problem. 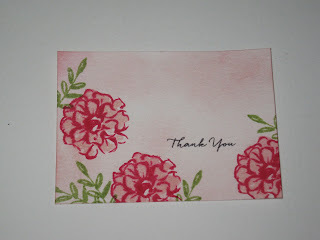 I grabbed my coordinating marker, because Stampin’Up! is brilliant for offering their matching markers and inks, and scribbled out a whole lot of ink from my marker and mixed it up with my water brush. Alas, it wasn’t enough ink to get the look I was hoping for. I tried several times. Man, I really wanted that re-inker. So there went my ingenious plan B out the window. Hmmmm, plan C, what could I try??? Ok, so how about this?? I took a fresh piece of watercolor paper and saturated the entire surface with my water brush. Then I used my ink pad and a sponge. I inked up my sponge and swooped, yes swooped, it across the paper. Hmmmm…that’s not the effect I was hoping for. But wait…I kind of like that. What if I add more?? And so I begin adding more ink to the wet watercolor paper and watched. As the ink was absorbed it bled and blended and softened into a beautiful background. I was absolutely smitten with what was happening. You know somethimes trying to sponge a little color into your cardstock can be difficult. You get marks from your sponge or dark ink smudges that won’t soften. But this wasn’t the case with the wet watercolor paper. The ink from the sponge so easily diffused and softened. Once I decided that I loved this background, even though this wasn’t what I set out to accomplish, I started playing with my new stamp set. 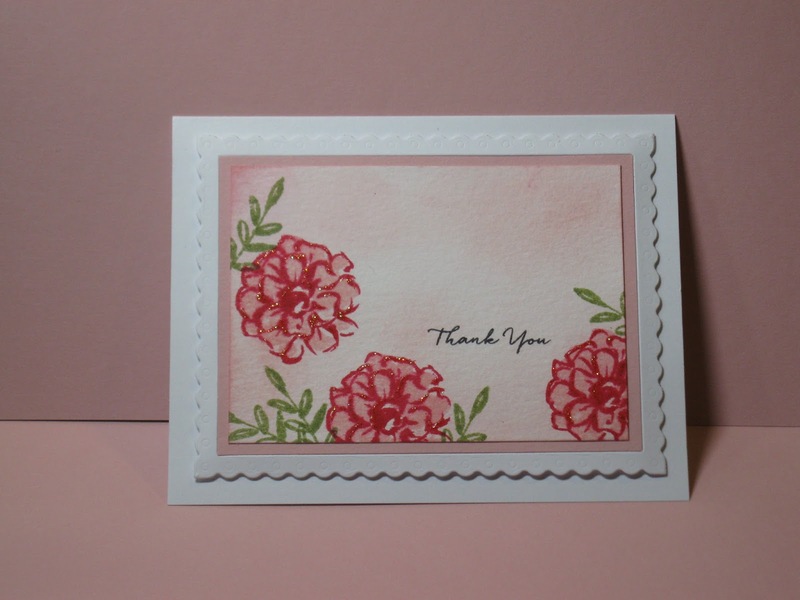 It’s a new set from Stampin’Up! called, What I Love. It’s a two-step stamping set that has a “watercolor” feel to it. Perfect for my background that I had just created, right? 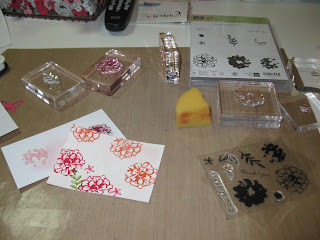 So I stamped with it a few times and played to get the feel for the stamp. Once I was confident how it was going to stamp up and I knew I could line up the layered images successfully I started stamping on my newly created background. I stamped the outline of the flower first. Guess what happened? It started to bleed ever so slightly. Why? Because my watercolor paper was still slightly damp. But this effect just added to the softness of the artwork in my opinion and I love it! 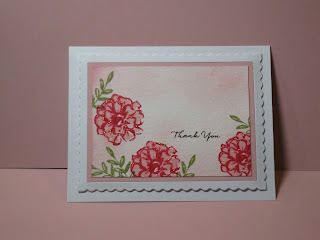 After I stamped the outline I stamped the ‘two-step” stamp part in the lighter color (which is the same color I used to create the background) to fill in the petals. 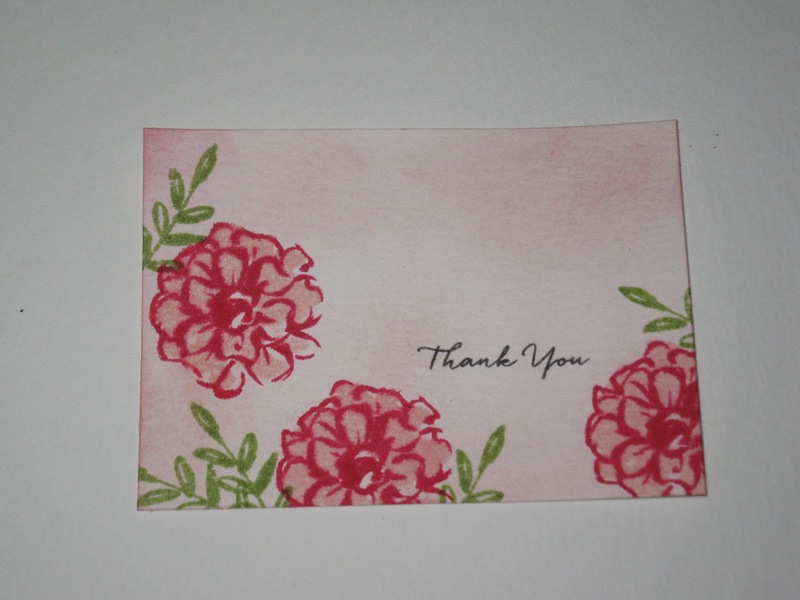 Then I added my green stamped leaves and a sentiment. A little matting, a little glitter (it’s me, of course there is a little glitter) and I called it a card. Here’s the finished product. I think I’m gonna get the re-inker in this color just so I can make the original card I had in my mind when I walked into my studio this particular morning. I really want to see how differently the side by sides turn out. Wouldn’t that be a fun comparison? Well there you have it. My accidental technique. I hope you will try it. It’s simple, it’s elegant and super-duper easy! I’ll list below all the products I used to create my card. I hope you enjoyed it. Thanks for popping in. I’d love to hear from you. The "accidental" background is so soft and beautiful!!! Can't wait to try it!!! So glad to see you "posting" again. Love your accidental background!